The adventures of two adults and two toddlers who've taken a year off real life to travel, explore, and have fun! 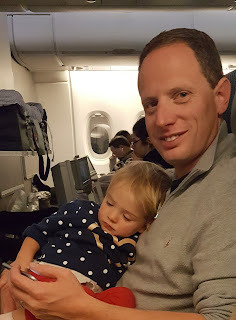 By the time our son was just over 1 year old he'd already taken more flights than his age in months. Crazy but true! He's now about to turn 4 and our daughter is 2, and while the maths of course had to slow down, our love of travel has not: we're British; our kids were both born in Australia; and we've just completed a family gap year in which we flew to Canada and the USA on two separate occasions for long-stay road trips. 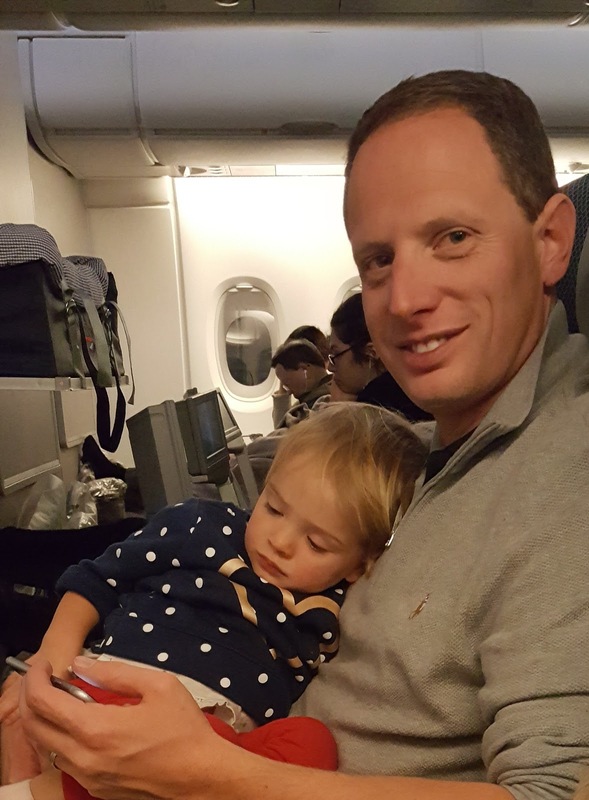 So my husband and I are very familiar with the trials and tribulations parents face when taking toddlers on aeroplanes! 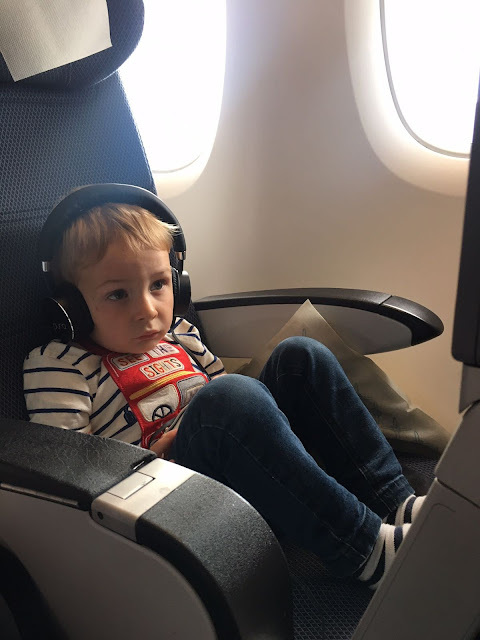 So whether you interpret this post title as "enter"-tainment or "con"-tainment (or both 😁), here are my top tips to help you stay sane on a plane with a little person (or two). Please note: the links below will take you to view the products on Amazon. If you click through there is no extra cost to you, but Amazon will pay me a small amount on any purchases made. These aren't the cheapest kids' headphones on the market, but boy have they been a great investment. They're noise-cancelling which helps kids listen at a safe level, volume-limited so older toddlers can't mischievously (or accidentally) turn them up too loud, and Bluetooth-enabled which prevents little nibblers from chewing the wires! (There is a wire included so you can connect them to the aeroplane jack but we used the Bluetooth connection for our iPad, for example). I even found our son just liked the comfort of them being on as they drowned out the loud background noise. 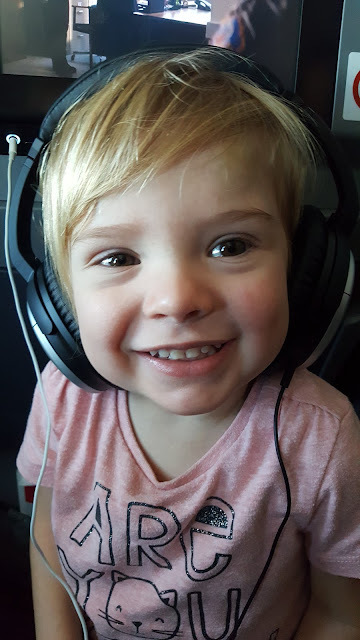 Here he is at age 2 on our flight from London to Vancouver. As far as head size goes, these can expand quite far so I can see our son being able to use them for quite some time. I can even wear them myself comfortably, and I'd say I have an average (female) head size. Now little Miss is 2, however, she's going to need a pair for herself as at the moment she just nicks my nice Bose headphones! (These are the old Bose Quiet Comfort 2 model, incidentally, and they're still going strong 6 years on). 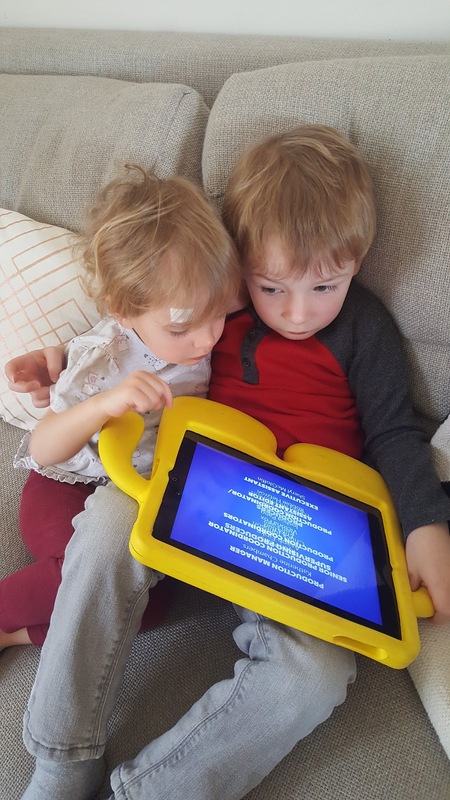 This kind of case means you can load up the iPad with plenty of kids' shows and games and they can then hold on to the device themselves comfortably while in their seats. The freestanding cases are particularly great because when they get fed up of holding them they can be stood up on the tray tables. 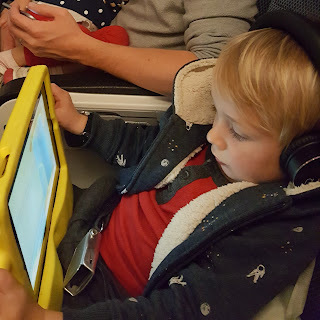 Here's young Master H on the plane back from San Diego to London with our iPad in the case (we opted for yellow - there are plenty of colour choices). We actually keep the iPad in this case all the time. It means the kids can actually pick it up and swing it around carelessly without the iPad coming to any grief, and I like that it can be stood up on a table easily too - perfect for Facetimes with the grandparents! Because the pens simply take water there's no need to worry about kids making marks anywhere, plus there are some fun reveals when certain sections are "coloured in" which keeps things interesting for little ones who don't care too much about the fact the car is now orange while the same pen miraculously turned the sky blue (it still blows my mind, ha ha!). We started with the vehicles one (the yellow pad in this 2-pack), then a friend gave me the animals one. Now I see Melissa & Doug have expanded the range to include letters, numbers, dinosaurs etc. - I'll be stocking up on these ones before our next flight! You open it up and it unfolds into two small drawing pads, one on each side, and in the spine there's a pen that you fill up with water and then the toddler can draw away to his/her heart's content. Again, as it's only water there's no need to worry about making any marks anywhere (useful on the plane AND in your holiday accommodation! ), and after a few hours the drawings fade and your little darling can start all over again. Hooray! And a word of advice: if your kids are anything like mine, they'll enjoy stabbing dots so ferociously the poor pen will eventually look like a young child's toothbrush. I bought a cheap set of replacement pens from another brand and they really don't work as well because they are fine-tipped so the water doesn't flow as easily, so if you do need extra pens be sure to look for the actual AquaDoodle ones (or at least some that have good broad nibs). 5. Medium-sized vehicle toys - our kids currently love Blaze and his monster machine friends, as well as Marshall from Paw Patrol (the small racer toy, not the bigger one with the detachable pup). Bonus tip: for a few extra seconds of entertainment we wrapped these up in old wrapping paper and the kids LOVED unwrapping them and guessing what was inside! It didn't matter that they were their existing toys: the element of surprise and then delight at realising their favourite toys had come with us was brilliant - far more so than I expected it to be. I totally recommend doing this. And why do I specify medium-size? Well, tiny cars are great at your destination (though they WILL get lost under furniture so be prepared to come home with fewer than you took out with you!) but on a plane little toys are just asking to get stuck down the side of the armrest at the window, or else roll away underneath your seats. So we try to only bring toys of a decent size in our hand luggage to avoid tears of frustration (and that's just my husband trying to reach under the chair to retrieve the toy!). They won't roll off the tray tables (SUCH a genuis idea - I'll never buy round crayons again), and if the kids do stray off the paper crayon usually wipes off pretty easily. Just don't forget paper! Oh, and there are loads of books in the "That's Not My..." series so you can choose whichever theme suits your little one(s) best - some of the most popular ones are below to give you an idea of the range! 8. Stickers - for aeroplanes reusable stickers are ideal, like the Melissa & Doug Reusable Sticker Pad, not just so you can reuse the same stickers and backgrounds but, more importantly, you won't spend the whole flight scratching them off the armrests, window, or tray tables! Though if you're after something multi-purpose and know your kids will keep the stickers to sensible places (paper, your arm etc. ), Crayola make lots of fun sticker books that have pages where older kids can colour in too. - Fruity cereal bars (no particular favourite brand here; we just change it up as our kids often eat one of these each a day). 10. Your phone - I recommend... keeping it hidden for as long as possible! In my experience eventually we have to relinquish our phones to the little people at some point in a journey when nothing else will placate them. On this occasion little Miss was in a right grump and Daddy's phone was the only thing that would do the trick. So basically my recommendation here is to try to have it fully charged, take the lead with you as there are often USB ports at the seats, and try to download a few kids' shows in advance so there's something they can watch at a moment's notice. And there we have it: my top 10 things to keep toddlers enter/con -tained on a plane journey. Let me know if you have any favourites too, especially for older kids as my expertise currently only goes up to age 4, ha ha! Next up I'll be writing about how we like to handle stopovers, what I pack in our hand luggage and how we handle changing time zones. Do let me know if there's any other topic you'd like me to cover as I'm always happy to help other globetoddlers. Until next time: keep adventuring! Would you like to know when there's a new blog post? Want to know when there's a new blog post?